I walked into her kitchen and saw it simmering on the stove – my mom’s homemade Sloppy Joes. My mouth watered, and memories came pouring back, bringing me right back to my child hood. It’s amazing how one simple recipe can do that, isn’t it? There’s something so special about the way family recipes create lasting memories. Typically, there are stories surrounding them, and yet often we don’t take the time to gather those recipes until it’s too late. Originally, this Sloppy Joe recipe came from my Aunt Lori, passed onto my mom and then served at so many of our family get togethers and birthdays. When I saw my mom’s handwritten recipe cards this past Christmas, I began brainstorming ways I could use them to decorate in my kitchen. I love the drops of sauce, the fingerprints, the scratched out spots where she was figuring the math for extras – so many memories inclosed in those few lines. 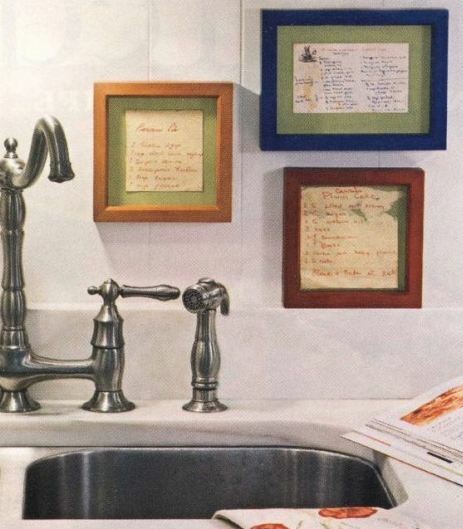 I don’t have a full wall to dedicate for special family recipes like this, but for those who do, what a wonderful way to add a cherished bit of history and personality to a wall. I love the fact that these are all handwritten. I have a few typed recipes that I am going to ask my mom to write out in her own writing, and it would be special to create a large collage. This is my plan for decorating with recipes. I will probably just mat and frame a few small cards to spruce up under my cabinet. It will be a small area, but one that carries such sentimental memories and will be such a great conversation piece. Recently, I began collecting just a few vintage kitchen tools. I love imagining living in more simpler times, but I haven’t been able to come up with a good way to display them. 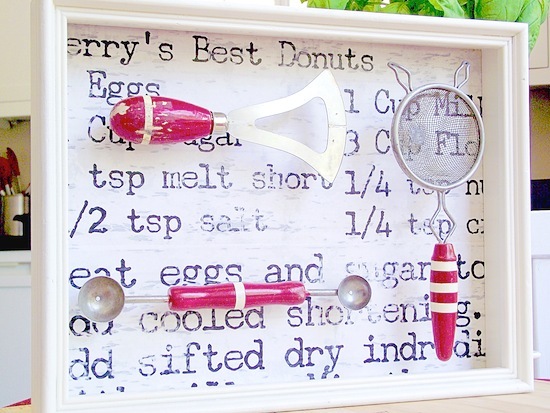 Amy shared her friend’s wonderful idea of mixing a favorite recipe with vintage utensils for one adorable Shadow Box. I love that. I’d love to hear if you have any neat ideas for using family recipes? Do you have a specific recipe that every time you eat it or smell it or see it, you’re brought right back to a specific time or place? 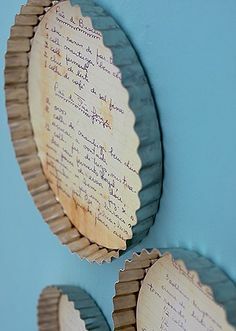 I love the idea of recipe decorations! 🙂 And it is too cool that I am first to linkup this week. Thanks so much for hosting. I saw this idea floating around on pinterest: take a .pdf of your recipes, have it printed on linen and turn it into tea towels. Something beautiful that you can use daily in the kitchen too! I’m thinking about doing this for my mother in law for Mothers Day. 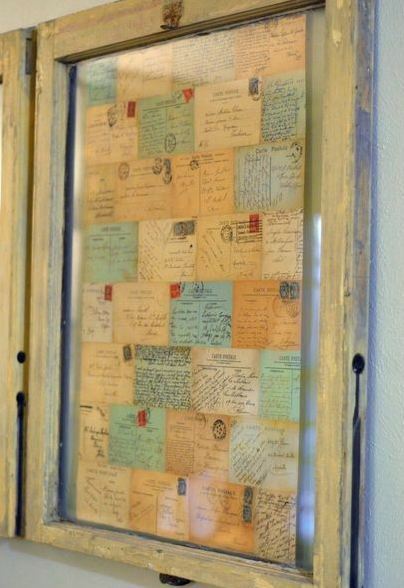 What a wonderful idea I think I am going to copy my grandmothers and frame it! These are such great ideas! Thanks for sharing! One of my top 3 wedding gifts was a framed copy of my great-grandma’s famous rolls recipe, in her handwriting! She died when I was 7, and I am the official family roll-maker now, so it was especially meaningful. Laura – I would LOVE to see that. Anyone you can snap a picture and send it my way? I’d love adding it to this post. I LOVE that idea! Talk about unique artwork! I *love* this idea! Sometimes I bring the laptop into the kitchen to make a recipe, but then I get sad that I won’t be slopping a mess all over the recipe (well, I could, but that would be bad). 😉 My Grandma just passed a way a month ago, and she had boxes of amazing recipes (“receipts”) in her handwriting. 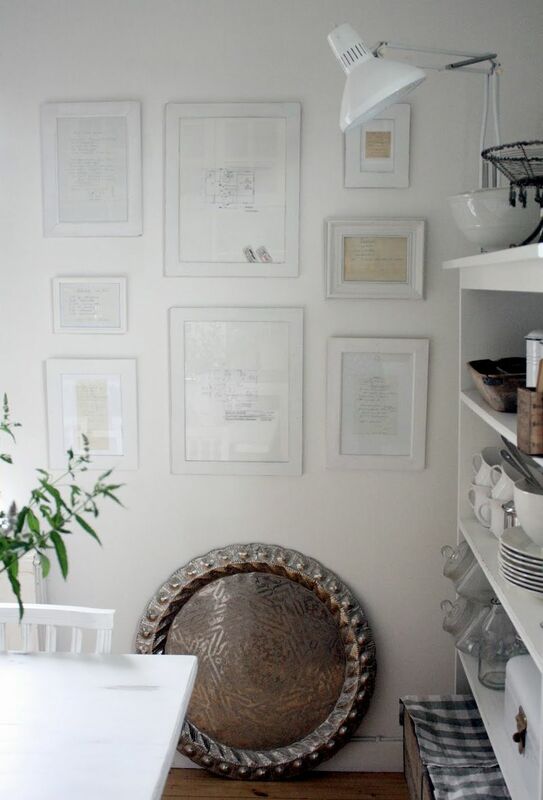 Framing them for the kitchen would be a sweet gift to her children. I’m linking up my hubby’s birthday cake today. It’s a Carrot Cheesecake Cake that I am having a lot of trouble not eating before we sing Happy Birthday to You. 🙂 Have a great week! 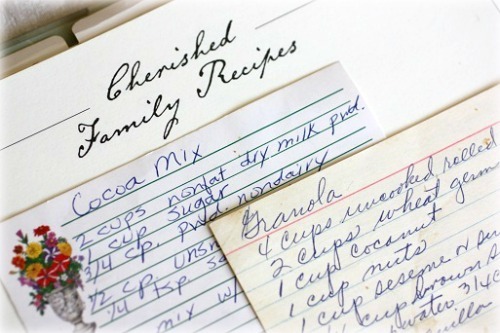 What wonderful ideas for preserving family recipes! There are so many family recipes that bring back memories, and that I have incorporated as part of family traditions with my husband and son. 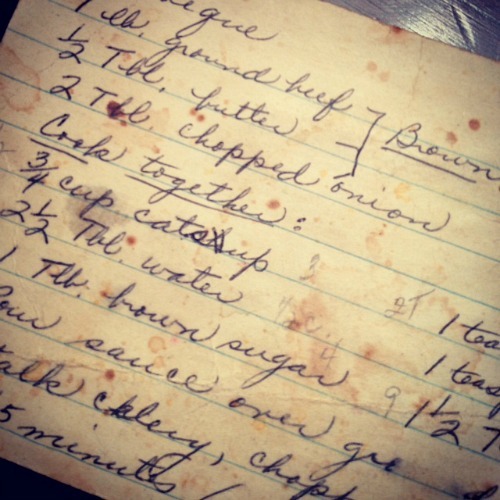 From ‘Meat Loaf Wellington’ to ‘Grandma’s Garlic Bread’ and ‘Auntie Margaret’s Spice Cake’ and more, family recipes are the backbone of my cooking and make me feel connected across the generations. 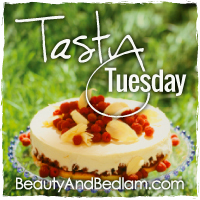 Thank you for hosting Tasty Tuesday. This week I’ve shared a frugal, quick and delicious One Pot Beef Noodle Supper. What a great idea! After my dad died my aunt sent me some photo copies of my granny’s recipe cards. It is so meaningful to me. I’ve been wanting to do something with them but wasn’t sure what do. I think I’ve just found the right idea. I framed a bunch of my Grandma’s hand written recipes a couple of years ago. They are so great because they are written on things like a pay stub from my Grandpa and a old phone bill. I treasure these! Wow, really cute idea about the recipe decorations! 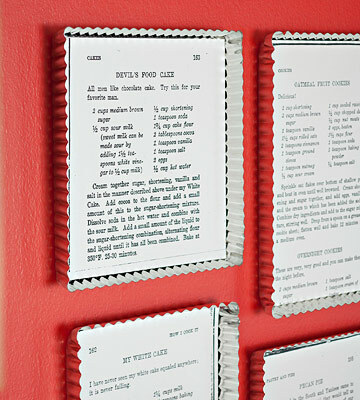 That would be a great way to get my go-to recipes off the side of the frig! Looks gorgeous! Thanks! Woah!! i really don’t like your ‘pop-up ad’ !! What was it? I have them all block, but obviously not? Would love to find out so I can see where it’s coming from. Hopefully, it was just a fluke thing. Yes, excellent suggestion. I completely agree. Very sweet, and it not just used for recipe, personally I use it for to-do list. Extremely pleasant to look at! My favorite frame in my home right now is a vintage photo of my grandmother with one of her recipes framed beside it and then one of my mother with her handwritten note framed next to it. So it’s a 4 plex frame and works perfectly for this. It reminds me of why I miss them both so much and some of what they represented to me in life. Renee = what a special, special memory.